No wind and we had the pond to ourselves. Serenity….only spoiled by the dead loon and its lonely mate. 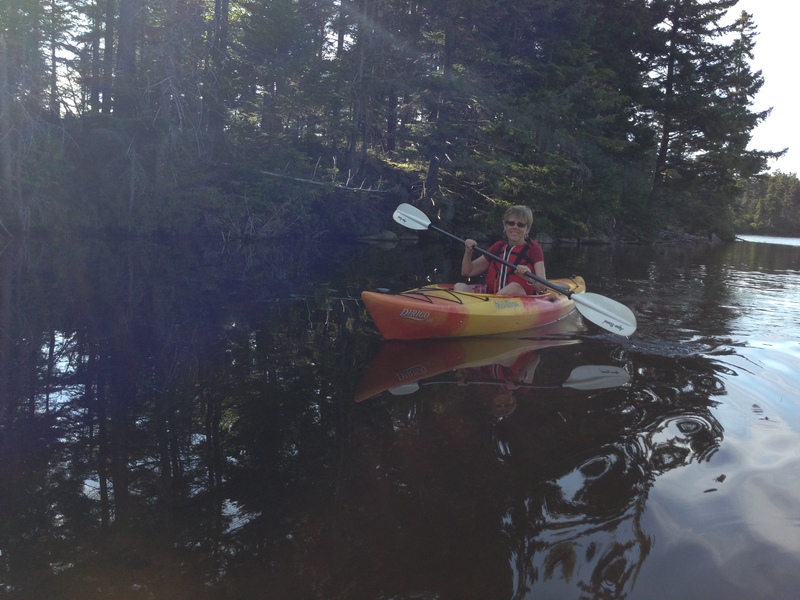 Perfect for kayaking on Long Pond. As soon as Steve walked through the door from work, I was ready for him to load the kayaks while I filled the cooler. Saw some ducks and what we believe was an immature bald eagle (we determined after we looked it up in the bird book when we returned home). In the middle of the pond we watched a lone loon dive and surface, careful to keep his distance from us. The week before we had seen his (or her) partner floating dead trapped in the tall grass along the edge. This week it was gone. We missed their haunting soulful cry. No moose. It’s always the moose we hope to encounter and rarely do. And no sign of the heron we usually see. Could it possibly have migrated south already? As we neared the launch on our return, I didn’t want the glorious evening to end. I just stopped paddling, drifted, prolonging my enjoyment. I could have stayed there until the sun set. You can’t do that with life. Even if you don’t want it to end, it will. Paddle or drift, your life will end. It doesn’t take a genius to know that. When you have an illness as I do, you know it–you just don’t want to accept it. As for my book—that I do want to end. I need to paddle harder. And faster. Give it my all. But it’s so hard. Like kayaking on Long Pond when there’s a head wind off Mount Moosilauke. Started out thinking we would go to Bar Harbor for the weekend then realized, after finding very few rooms available unless we’re willing to shell out $800 for two nights, that this would be a good time to take the Martha’s Vineyard/Nantucket trip we’ve been pondering. We love Martha’s Vineyard and have taken several day trips there—and when I say day trips, I mean home to Martha’s Vineyard and back in one day. One long day…It’s so much harder for me to do that now. Last Saturday we did Ogunquit/Rye and I was confined to the couch for a few days after that so we decided our next trip will include an overnight or two at a motel. Now we’ve decided that we’ve been to Martha’s Vineyard enough (that could never be true for me but for this excursion we’ll go with that). Nantucket would be awesome (as day trippers) since we’ve never been there and it is on my bucket list. The internet is great—I can book the ferry reservations within minutes but the room?? Too many choices on the Cape…and yet so few that are available for one night. And then I need to factor in the potential traffic nightmare. Maybe we’ll just stay home and chill…. Those two moles I had scraped from my back? Luckily they were just atypical and only one needs further “surgery.” The appointment with the surgeon did get cancelled…..so now I get to wait until the end of November for the removal of the mole. Must be a history of melanoma doesn’t create a sense of urgency. One more thing to be thankful for, I suppose. I just realized it is scheduled for one year and one day after my adrenal cancer surgery—at least Thanksgiving is the following week this year. And Steve, you are on notice that we are hosting it. Just in case next year we can’t…. Major accomplishment—it’s now two weeks in a row that I have submitted two chapters of Anne to my writing group. In order to do that, I feel as though I have spent every free minute at my laptop. Of course I haven’t. I did manage to squeeze in that trip to Maine and two days on the couch not feeling well—and two days on the couch not feeling not well! I’m aiming for another submission this coming week—at this rate I’ll have the second draft completed in 2013. That shouldn’t even be seen as an accomplishment considering I am “retired.” But what happens to my book when Steve retires and we head to Arizona—and I’m no longer (temporarily) an active participant in my writing group?? We really need to get Facetime or Skype working. Just let the cat out and realized the sky is blue and the sun is shining. What shall I do?? Probably getting dressed would be a good start. The pressure…. As Joy has rented out her cabin and my DIY fun there ended with decorating the porch with a tablecloth and vase on the table and new cushions on the (purported family heirloom) rockers, I am turning my focus to Jesse’s house. I feel so fortunate to have the time (and hopefully permission) to help her with this project. My entire day is a blank slate looming in front of me (when I’m not visiting DHMC) with time to write. Spend time with family. Dream about designing. Is this what cancer patients mean when they say they feel blessed to have cancer? Or just my shallow interpretation? Hanging out with Jesse and her kids, working on my book and blog, reading lots of books, napping every afternoon, watching HGTV/DIY—these things might sound totally unproductive to most people, something they might indulge in on vacation or over the weekend—and not that long ago I was one of them—but now I see that life isn’t necessarily about being productive in the traditional sense of the word. Have my priorities shifted? Most certainly. I’m finding that the 50 t-shirts that I own are enough, especially since I’ve only worn 15 of them this entire summer. So no more time or money wasted on weekend trips to West Lebanon to buy even more clothes. I hope this is just the beginning of that shift. That there are more changes to come. Yesterday I stayed in my pajamas until 4 o’clock, working on my submission for my writing group tonight. It was a gorgeous day and yet I stayed on the couch, weighted down by my laptop, afraid that if I got dressed I would venture out of the house and end up embarrassed tonight at writing group. Which I will be anyway. I’m still not comfortable with going public with my writing. (And that includes this blog.) It wasn’t very long ago that I would hide my writing from my husband. Yet I can’t realize my dream of being an author (meaning a published writer!) unless my work rises to the level where I am not only at ease with others reading my work but proud of what they will be reading. And it won’t do that all by itself.